The demand for machine vision cameras is continuously rising due to increased automation in the manufacturing section. 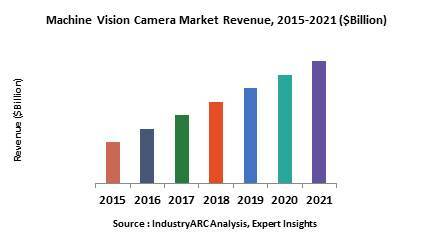 Line scan camera and area scan camera dominate the overall machine vision camera market. Line scan market generated a highest revenue of $679.3 million in 2017 and is estimated to grow with a CAGR of 9.47% during the forecast period 2018-2023. Asia-Pacific market generated a revenue of $388.4 million in 2017 and is set to grow at a CAGR of 10.6% during 2018-2023. The increasing investments in APAC region and adoption of automated devices are some of the factors which are driving the market. What are Machine Vision Cameras? Machine vision cameras depend on digital sensors with specialized optics to capture images, in order to process, analyze, and measure various characteristics by using computer hardware and software for accurate decision making. A machine vision camera can easily inspect minute object details which are too small to be seen by human eye if it is built around the right resolution and optics. Lighting, lens, image sensor, vision processing, and communications are the major components of a machine vision camera system. The light is converted into a digital image by the senor in the machine vision camera system which is further sent to the processor for analysis. What are the applications of Machine Vision Cameras? Machine Vision Cameras are used in various industries such as Electronics and semiconductor, healthcare, automotive, food and beverage, pharmaceuticals, packaging and printing. It has wide applications in location analysis, inspection, and pattern recognition. The purpose of the vision system in location application is to find the object and report its position and orientation. In inspection applications the purpose of the vision system is to validate certain features such as presence or absence of a correct label on a bottle, chocolates in a box, or defects. In an identification application, various codes and alphanumeric characters are read by vision camera systems. The use of metamaterial lenses to reduce the size of the camera in machine vision equipment is one of the latest trends in market. Machine vision cameras are used in the identification of items during the manufacturing processes and hence require a small camera that can be used in the process of identification. The reduction in the size of cameras provides flexibility for data capturing and identification solutions, resulting in growth of the market. In 2018, a leading manufacturer of digital high-speed imaging systems, Vision Research introduced Phantom S990, the world's fastest machine vision camera. This camera consists of right combination of high resolution and fast frame rates and has wide variety of applications in multiple industries. It brings the power of high speed streaming data to machine vision application along with flexible signaling and synchronization. Several machine vision companies are focusing towards reducing the size of pixels to get high resolutions in small packages. The pixel size is believed to go down from 4.5 um to 3-3.5 um. One of the benefits of smaller pixels is the ability to get more pixels in the same optical format. With the improvements in CMOS, this will enable inspection and measurement of smaller structures and more complex structures. Developers are also focusing on improving the global shutter and performance. PC based hyperspectral adoption has become necessary in several industries to identify materials, find objects, or detect processes that are not visible to the naked eye. Hyperspectral cameras combine spectroscopy and digital imaging. These cameras will gain a wide market in the near future as they have wide applications in manufacturing, military surveillance, environment testing, mining and mineralogy segments as well as medical diagnostics. There is also adoption of hyperspectral imaging in various medical procedures and diagnostics. Who are the Major Players in Machine Vision market? The companies referred in the market research report are Sony Corporation (Japan), Omron Corporation (Japan), Sick AG (Germany), National Instruments Corporation (U.S), Hitachi Ltd. (Japan) and 10 others.